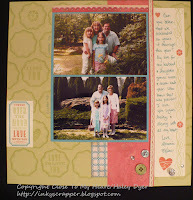 For my project, I had to scrapbook the ones I'm especially mad about, my family! These photos were taken at Easter this year, Easter '08, and summer '06. I love seeing how the girls have grown and how we've changed. One thing that remains the same of course is our love for each other! 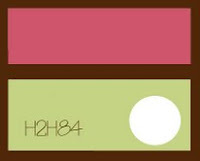 My layout is based on the Roxie workshop on the go, but I had to "mix it up" with my crazy color scheme of Sorbet (Roxie), Lagoon (Elemental) and Sweet Leaf. I think they match my photos well. 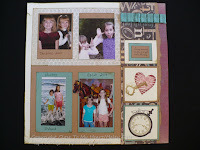 To create the backround, I stamped the frame repeatedly across the two pages, and then went back and filled in a few of them with sentiments from the set. 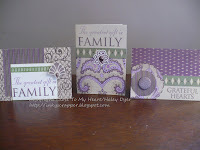 Everything that is stamped is from this set! I curved the swirl a bit to stamp around the circle. You've GOT to love My Acrylix for that! To embellish the layout, I used the "zip strip" from the Roxie paper, Colonial White ribbon, various blue and green buttons, and a variety of sparkles. 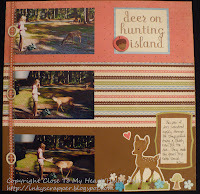 I simply used a Lagoon marker for my journaling. My second project (for now) is a simple scripture message. 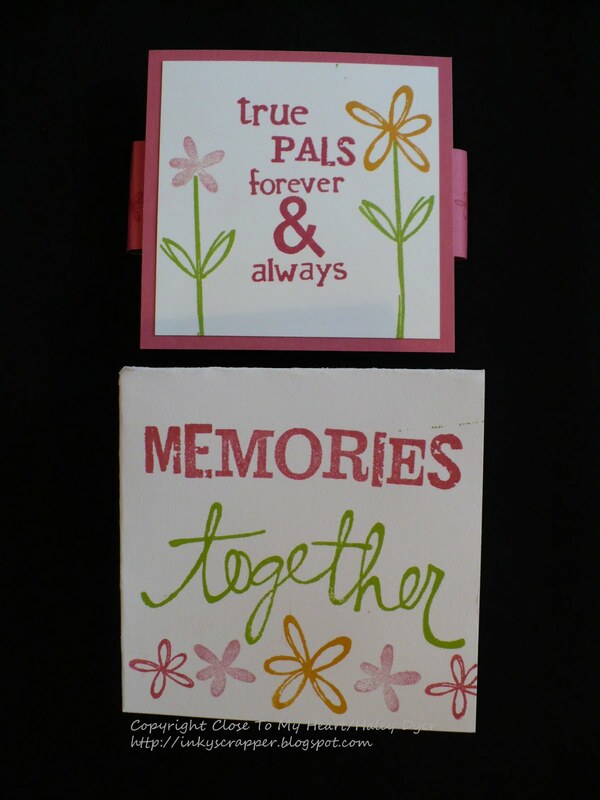 I have created a box of uplifing scripture using a My Creations Memory Game box set. 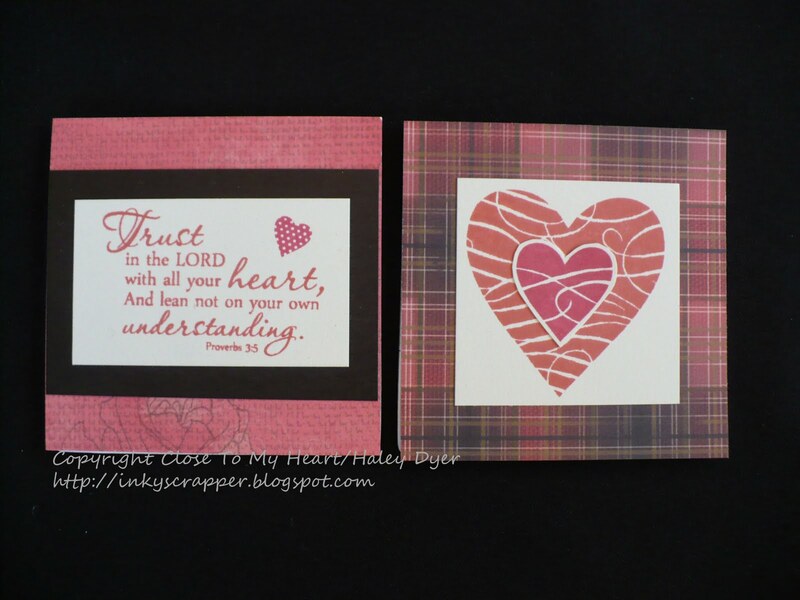 (The stamped scripture is from Verve, but everything else is CTMH.) I have found that too many embellies can make these hard to get out of the box, so I kept mine simple. That also makes it easier (for me at least) to focus on the message. Thanks for stopping by! The "Mad About You" December stamp of the month is only available this month, so be sure to get yours in time for your Valentine's projects- and more! 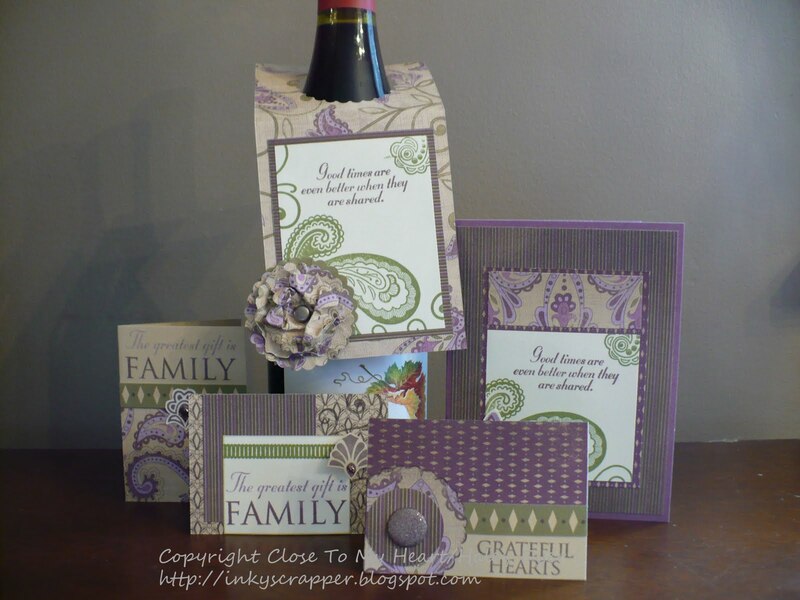 Now, head over to see what the Blessed Scrapper Sarita> has made for you! Even though the calendar says November, we're introducing the first Heart 2 Heart challenge of December, and Mary created this great sketch for you to try! Of course I had to be different and turn the sketch 90 degrees. It couldn't have come at a better time since I am making a table top display of my daughters' visits with Santa. (I'm taking the entire series of photos and using them on little layouts made with a My Creations All-Sorts mini album, turned so that the "spine" (with the holes) are at the bottom to make a table top display instead of a book. I will post the completed display as soon as it's, well, completed!) This entire project is using the retired Mistletoe and Evergreen papers (still available in Studio J!) because they match the Santa photos so well. I also made a really quick card with this sketch using the Believe paper pack and my "I Believe" stamp set. 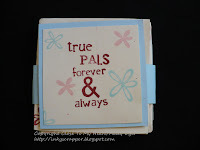 To create the two-toned message, I stamped the sentiment in Sky ink onto the scalloped circle. 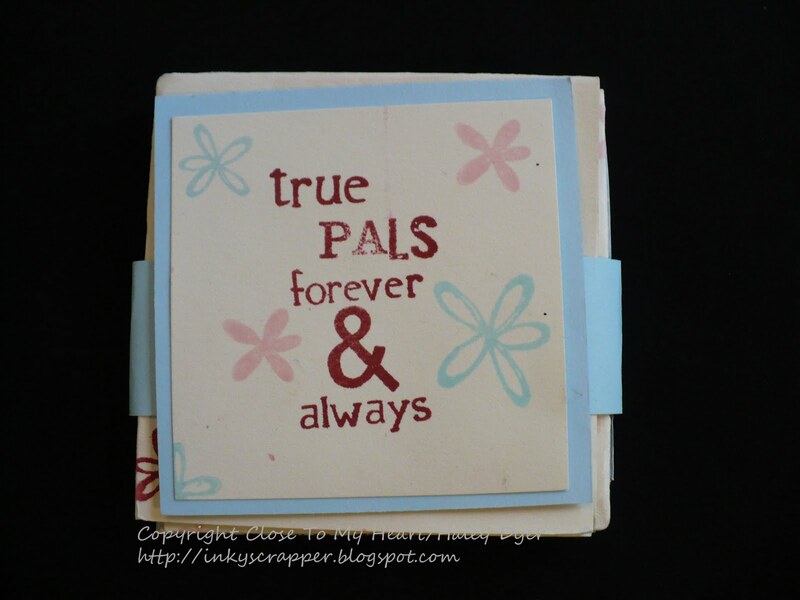 Then, on scrap paper, I stamped the message again in Holiday Red ink, cutting out Believe very carefully to adhere it to the focal sentiment. A few sparkles finished it off. Now, it's your turn to try this sketch. 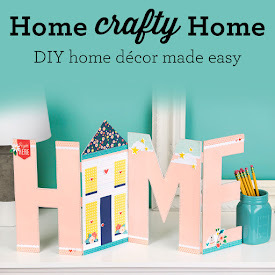 Be sure to check out all the H2H designers for tons of great inspiration, then get crafty, post your creation online, and link it up to the H2H blog. 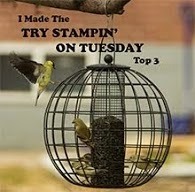 We love seeing your work, so bust out your CTMH products and get to work. 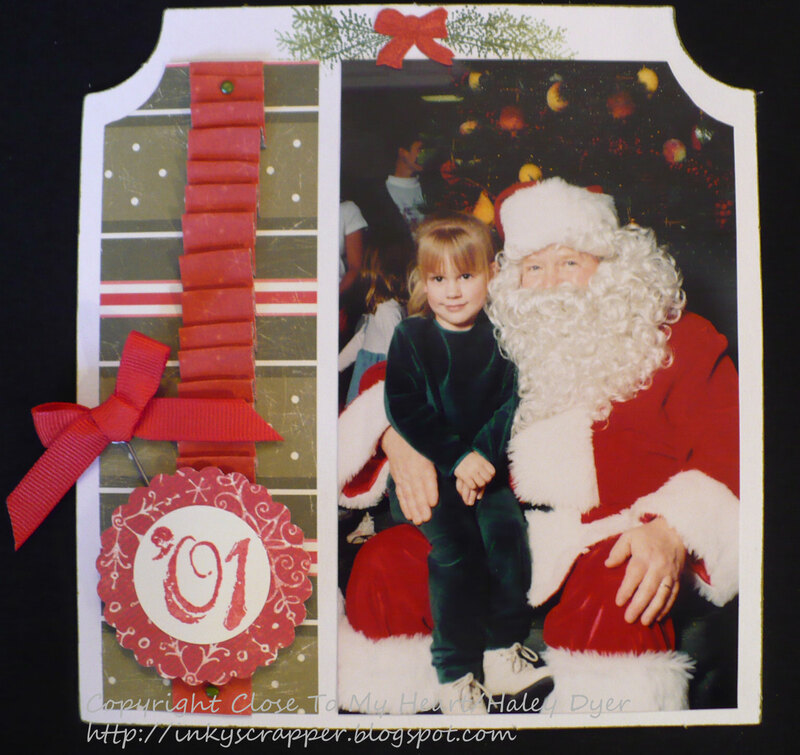 (If you use a Christmas theme, you can get some holiday cards made in a flash!) See you over at H2H! 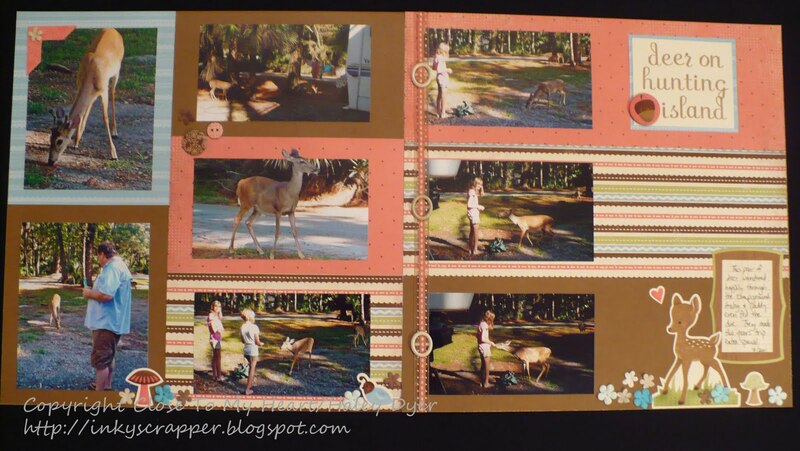 This month's Scrap Our Stash challenge is a recipe challenge to either incorporate a recipe on your layout or use this recipe: 5 embellishments, 4 words in title, 3 photos, 2 patterned papers, and 1 solid cardstock. Whew! 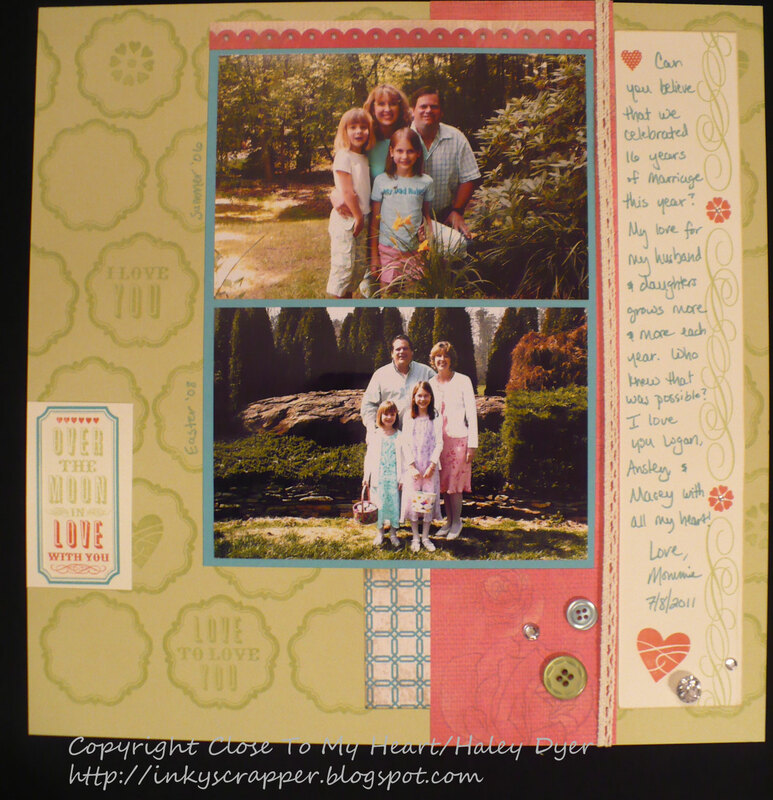 It was a challenge, but I managed to do it on the right page of this layout. 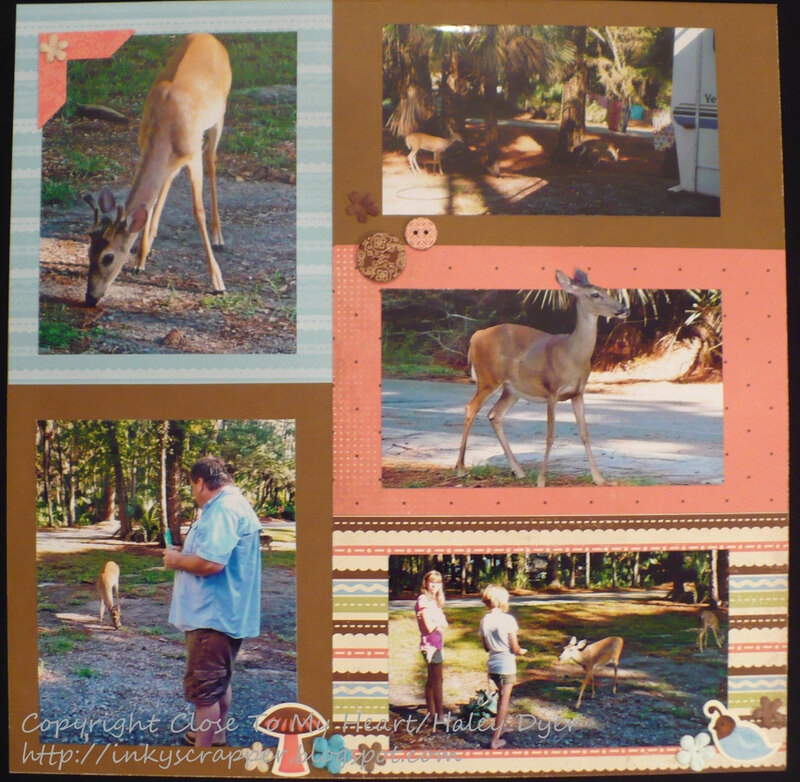 We were so surprised this summer when a pair of deer walked right through our campground. 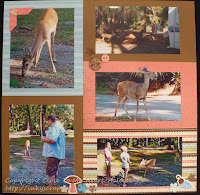 We have camped on Hunting Island State Park (SC) for many years, but this was the first time deer visited us. 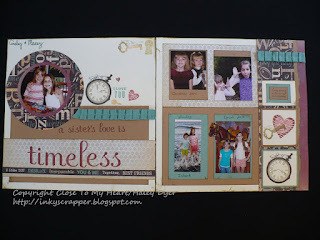 Instead of using five embellishments, I used five different embellishments on my layout. It may look like I used three patterned papers instead of the required two, but the Crystal Blue frame around my title is the back of the striped paper. All of my supplies are from Close To My Heart except for this tiny blue flowers (source unknown), although this paper line is now retired. If you'd like to give this month's recipe challenge a try, you've got a little time left. 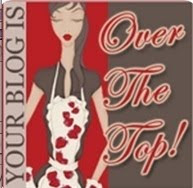 Be sure to head over to the SOS blog for inspiration! All skill levels are invited to play, and any products can be used. Scrap your stash! 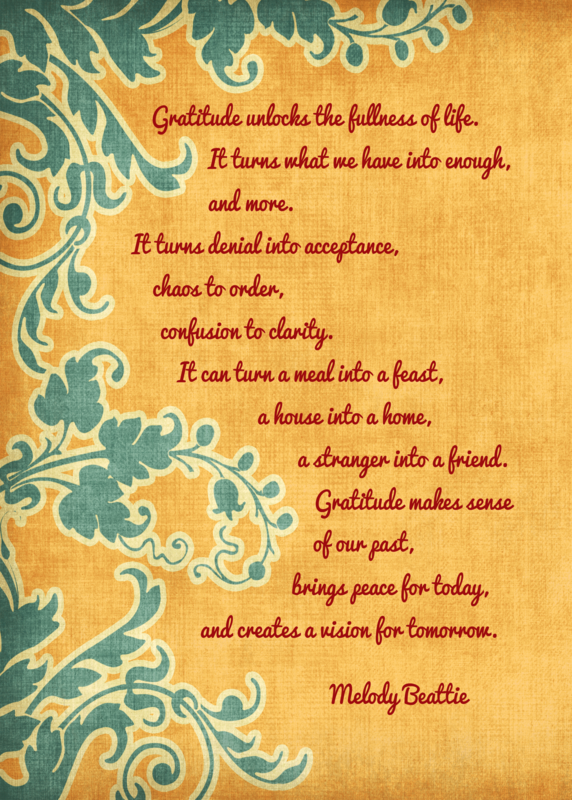 Gratitude Word Art (Printable Freebie) & Happy Thanksgiving! You can download this beautiful word art by Jill Paulsen at A Matter of Memories in either 5"x7" or 8"x10" for instant holiday decor. Today was a furlough day for me instead of a teacher workday, so I worked around the house, did the grocery shopping, etc., to get ready for the big turkey day. We are eating with my in-laws Thursday evening and with my family Saturday evening. Life is good and bountiful. 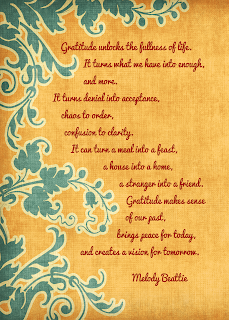 Count your blessings and remember an attitude of gratitude! Here is the entire book opened up. How fun is that? I'll leave you with the book my younger daughter made (in her favorite color, blue) to help me gauge the time and difficulty level. Isn't hers adorable? I flipped through my picture drawers to find several random- and favorite- photos of my daughters together through the years. 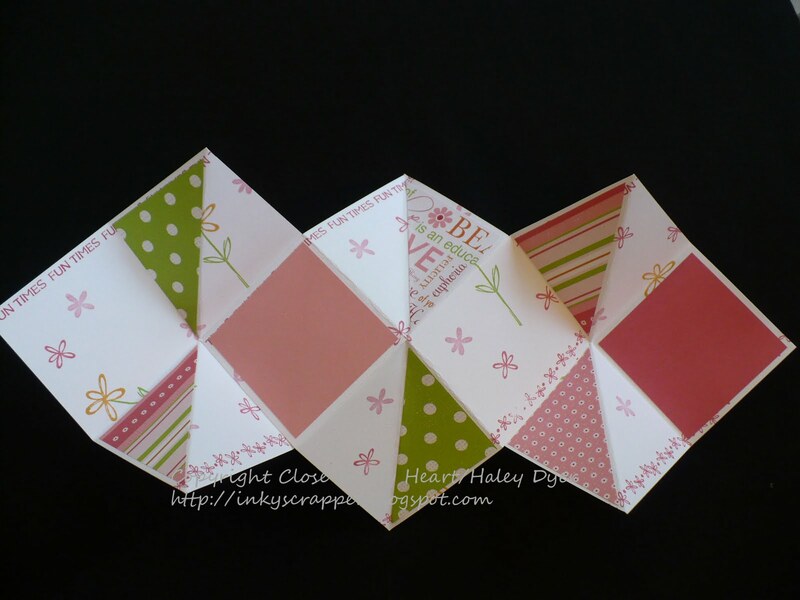 Then, I browsed through the Magic how-to guide until I found the perfect layout sketch. At first, I was afraid this sketch wouldn't work because I had more photos than recommended. 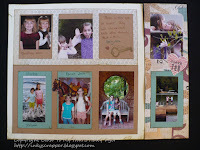 Adding a flip flap to extend my page was the perfect way to add those extra photos! Here are close-ups of the right page first closed and then open. These girls sure make my heart melt! 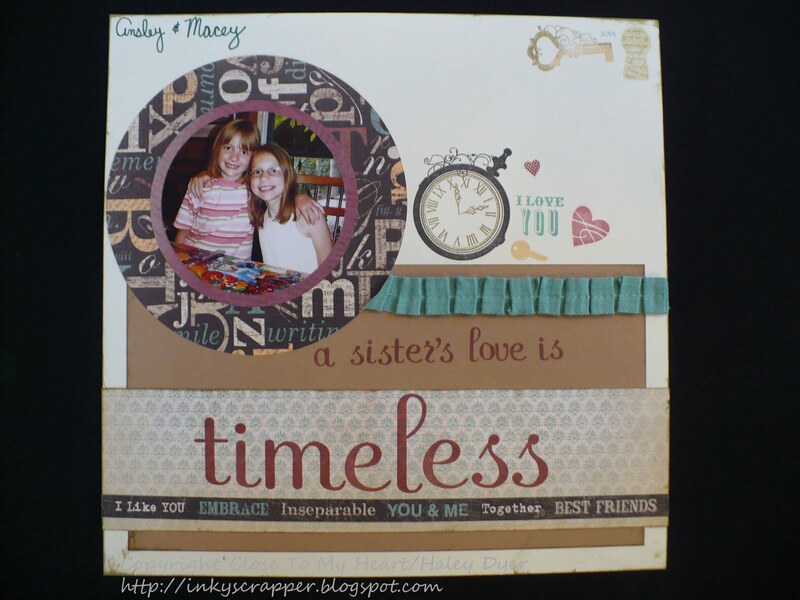 Now it's your turn: get your craft on and let us see your TIMEless creations! 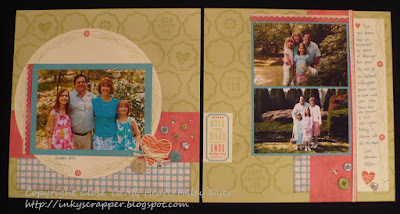 Check out the H2H Challenges blog for inspiration and to link up. 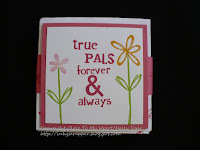 My card uses the "Neutral Shadows" heat embossing technique. 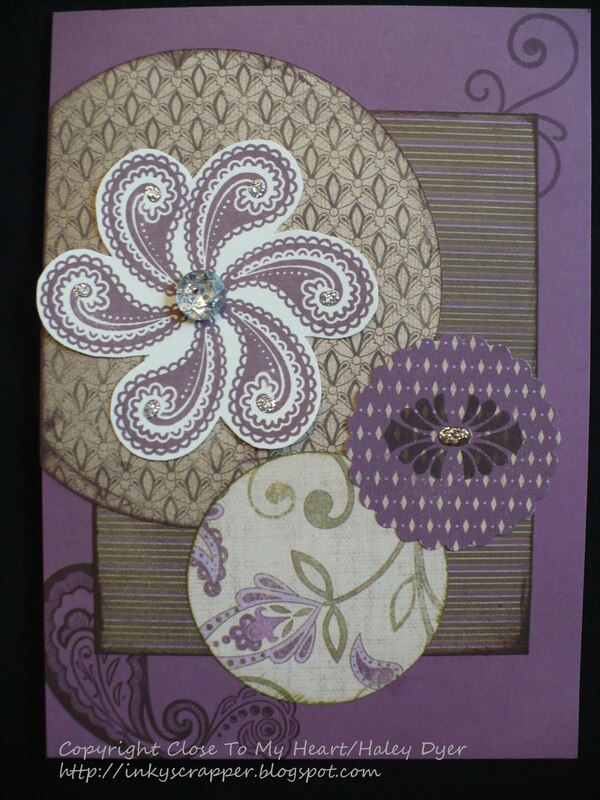 You can see my original, similar card with this technique HERE. The technique is pretty simple to do. 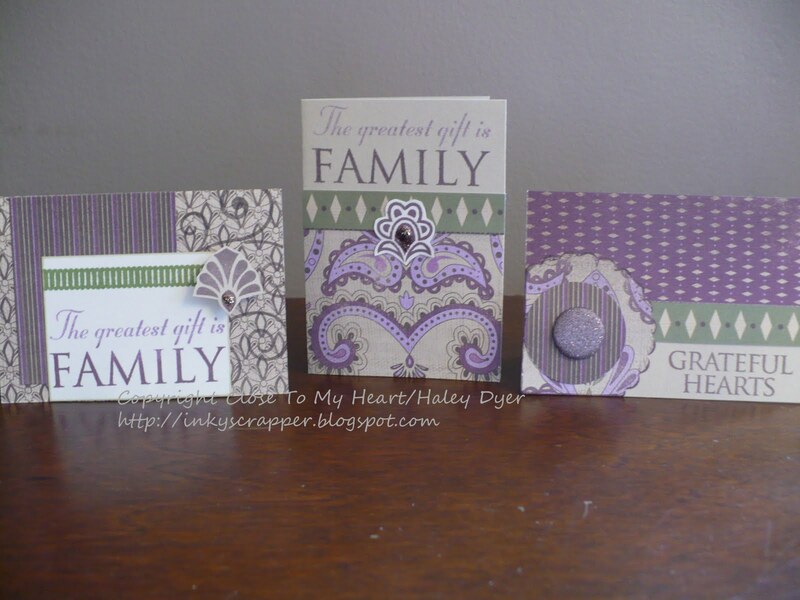 Basically, you heat embossing your images in the same light color as your background (in this case white on white). 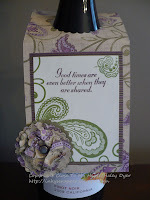 My flowers are from the Treasure Life stamp set. 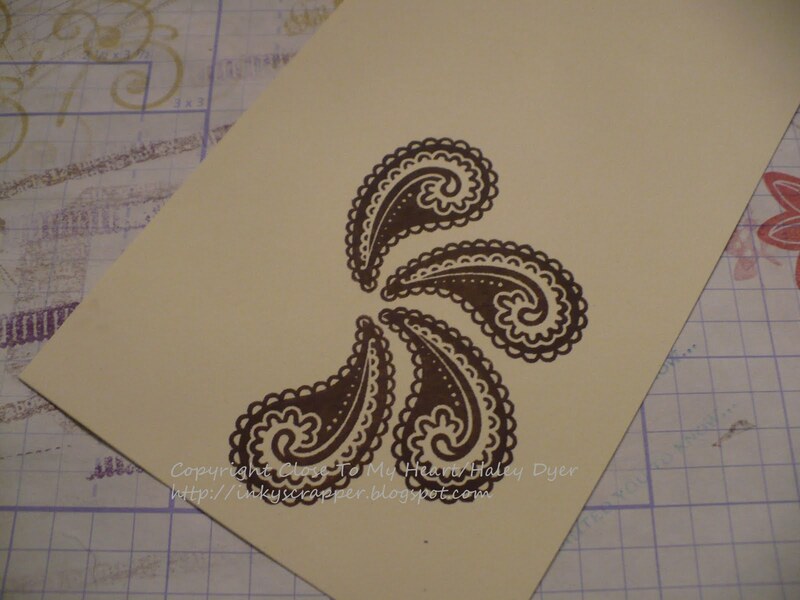 Then, stipple ink over and around the embossed images. 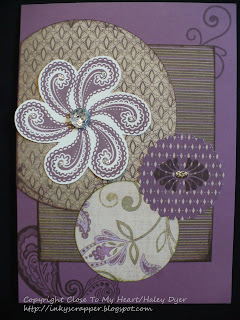 I used Smoky Plum to match my cardstock card base. 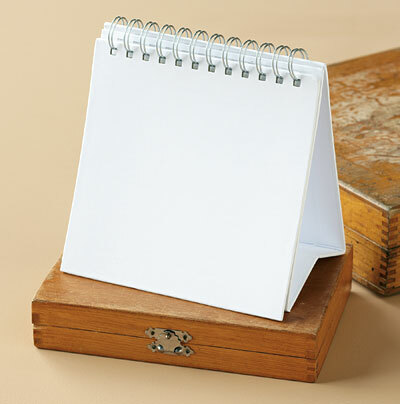 Finally, buff off the excess ink with a kleenex or paper towel and your white images pop. 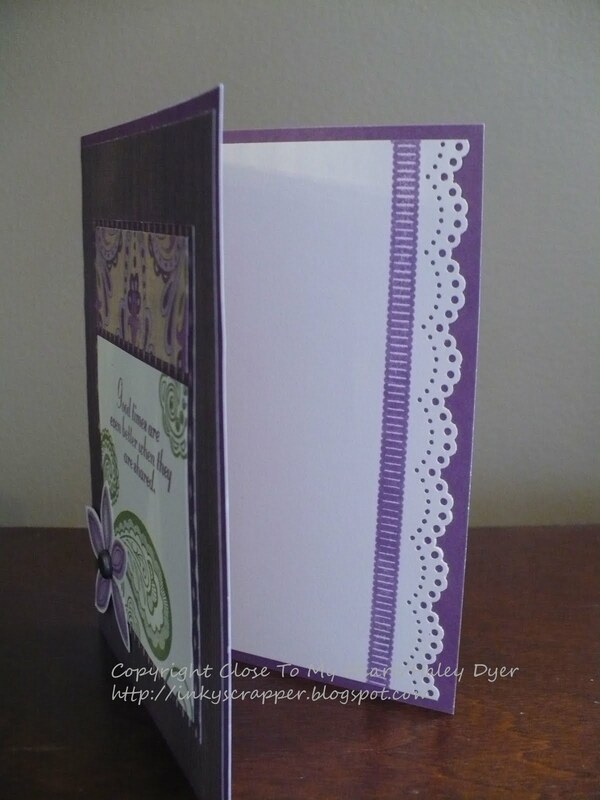 To finish my card, I wrapped sheer organdy white ribbon around the front panel, and then attached the sentiment (from the Salutation Seals stamp set, stamed in Smoky Plum ink) over the ribbon and offset. 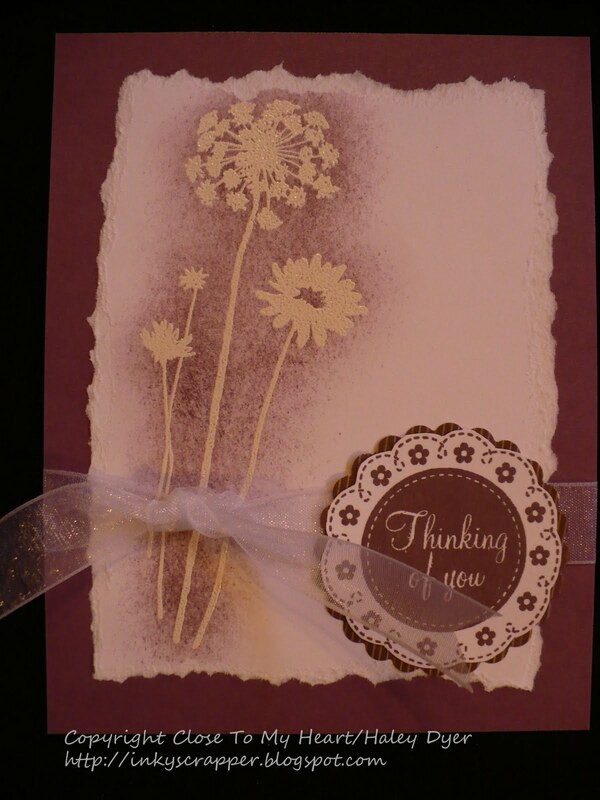 I think this card is very simple yet elegant. I hope that you like it too! Thanks for leaving me a comment! 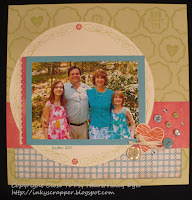 Now head on over to Tamytha's blog. 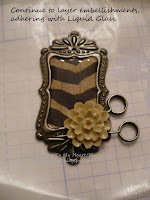 My first project is a bottle tag (which I am also linking up to CAS-ual Friday's "Tag, You're It" challenge.) 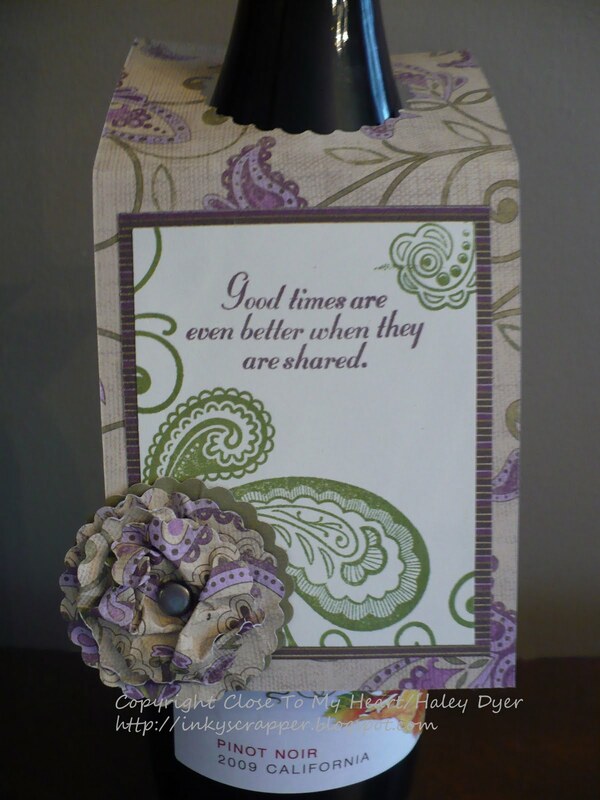 Don't you think this would make a lovely hostess gift to show your thanks? 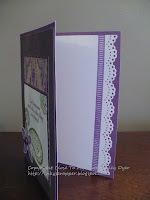 It was really simple to create, and I had a scrap of Sonoma paper that was the perfect size! 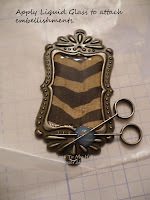 I just used the scalloped circle punch to cut out a whole in the top center to make this piece hang onto the bottle. 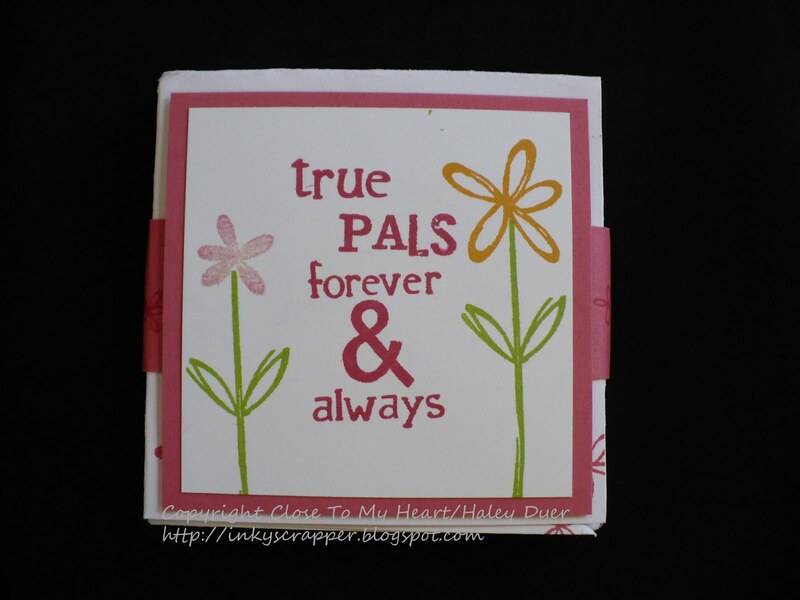 The back includes a piece of Colonial White cardstock on which to write a personal message. Then I decorated the front similar to my card, below. This card's decorations were inspired by the Sonoma Workshop on the Go instructions, but I didn't want to make a 6"x6" card. 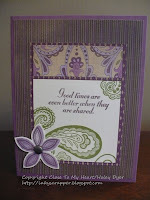 Instead, I used the "Sentiment Secured" pattern from the Wishes how-to book. 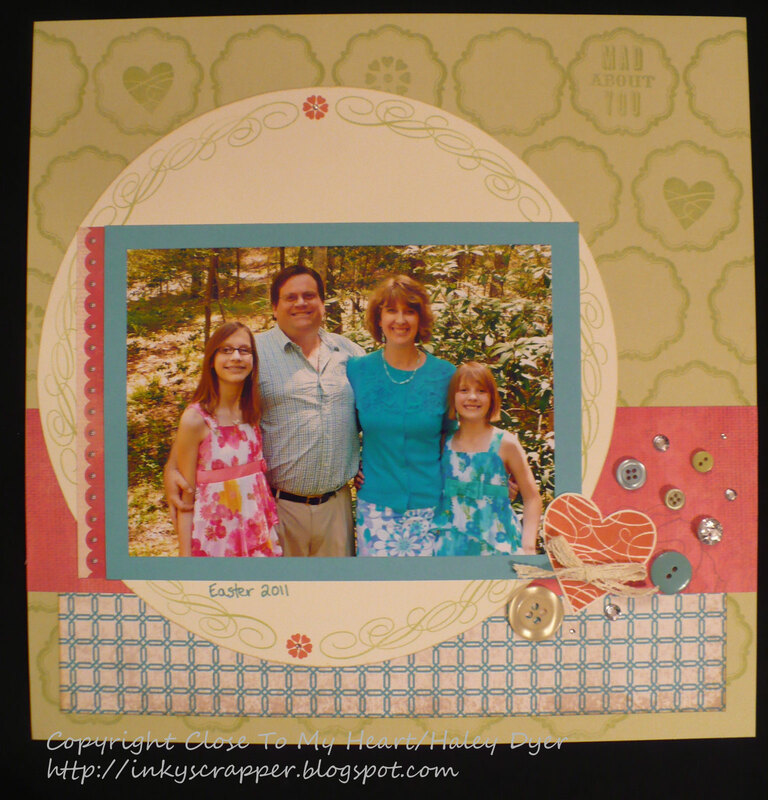 Here's a peek at the inside, stamped with the "ribbon" from the Sonoma Workshop on the Go stamp set and punched with a Martha Stewart lovely. Thanks for stopping by! 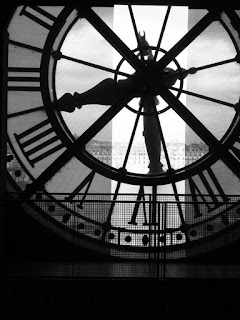 I'd love for you to leave a comment, especially sharing what you're grateful for, before heading on. 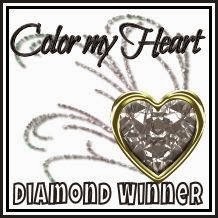 Thank you, dear readers and visitors! I am grateful for YOU. Are you familiar with Close To My Heart's Workshop on the Go kits? 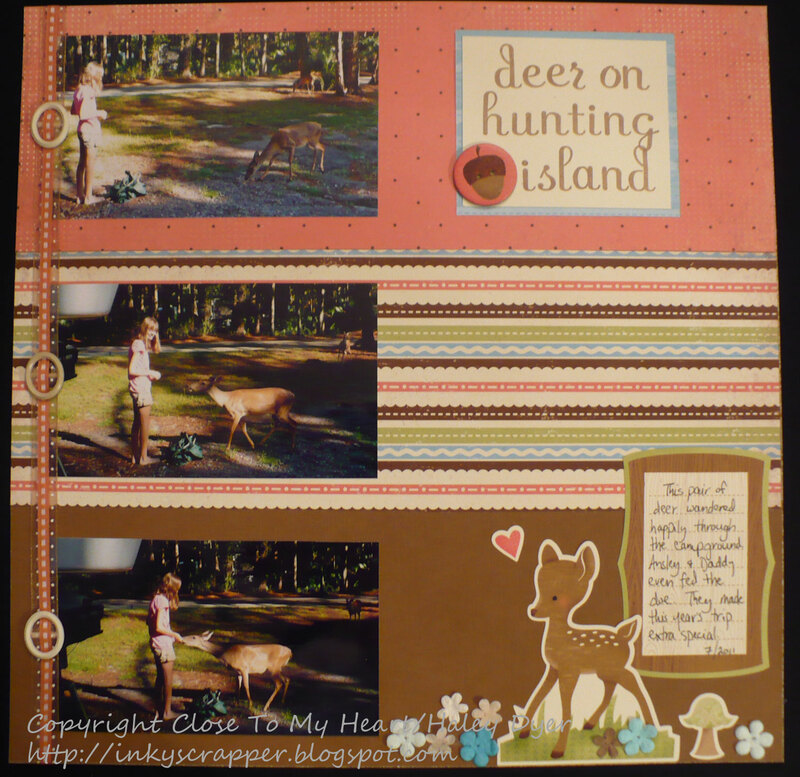 They are a great value and even include instructions for a scrapbook layout! You get a paper pack, and exclusive C-size stamp set, and at least two other goodies (embellishments and/or tools) to create tons of wonderful projects! My card uses the paisley stamp from the Sonoma Workshop on the Go kit in a fun way: as a medallion! 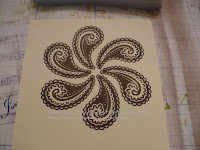 First, I stamped the paisley once, and then I started stamping the paisley again and again as I moved around the first image in a circular shape. It took a little practice to get them fairly evenly spaced, but I think I succeeded. Finally, I cut the entire piece out as one medallion. A pretty sparkly button in the center finishes it off. 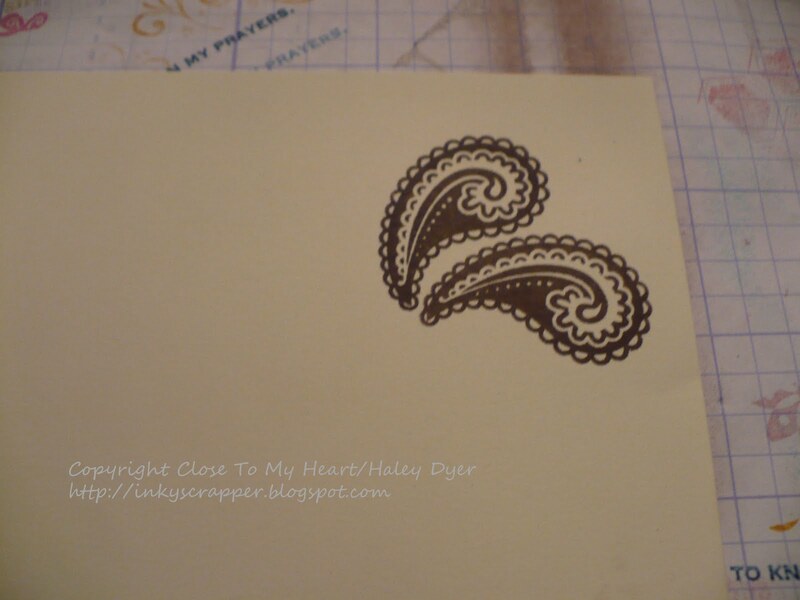 I also used a little silver glitz glue for the other decoration on this 5"x7" card (pattern from Wishes). 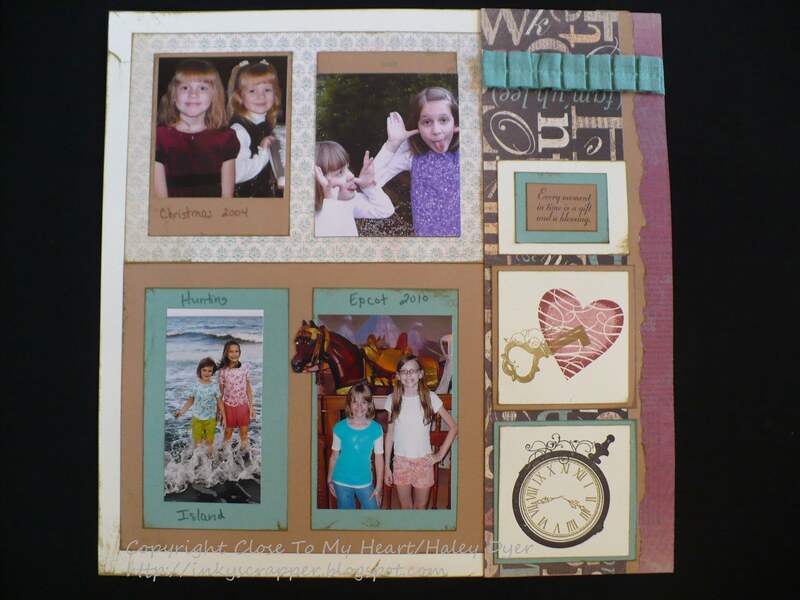 You are absolutely going to love the keepsake that you will make at my "This Year"/"Through the Years" 6"x6" album workshop! 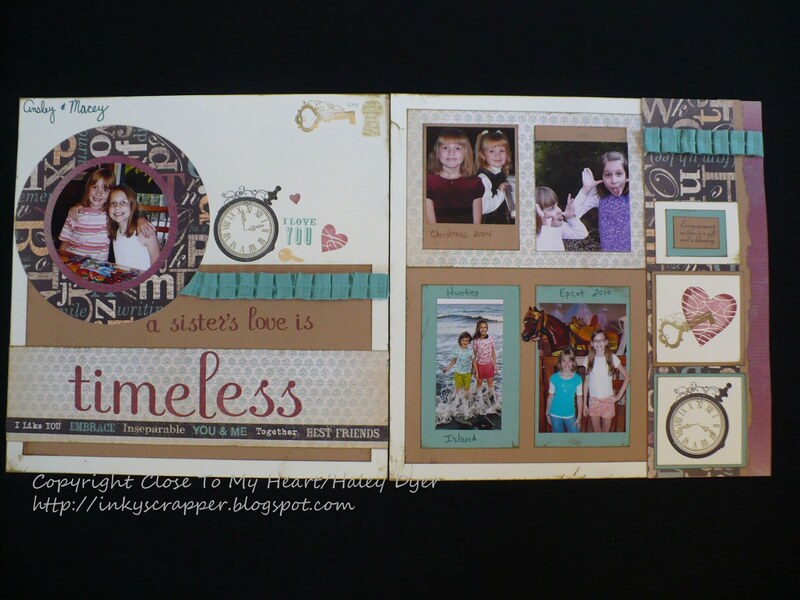 If you've ever wanted to start scrapbooking, now is the time! This project is for all skill levels. 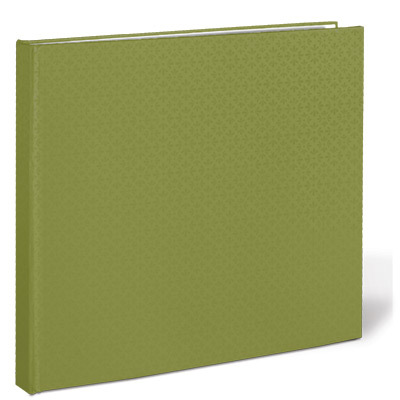 We are going to use the November stamp of the month, Cherish the Day, to create a month-by-month twelve-page 6"x6" album to hold this year's (or any year's) highlight photos! 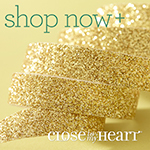 (Think about what a great gift this will make! 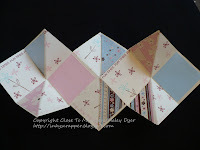 You are going to want to order at least two kits; one to keep and one to give away!) This workshop would also make a fabulous "baby's first year" album, no matter how old your "baby" is. 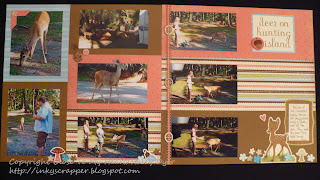 Each month will be highlighted with a seasonal layout. 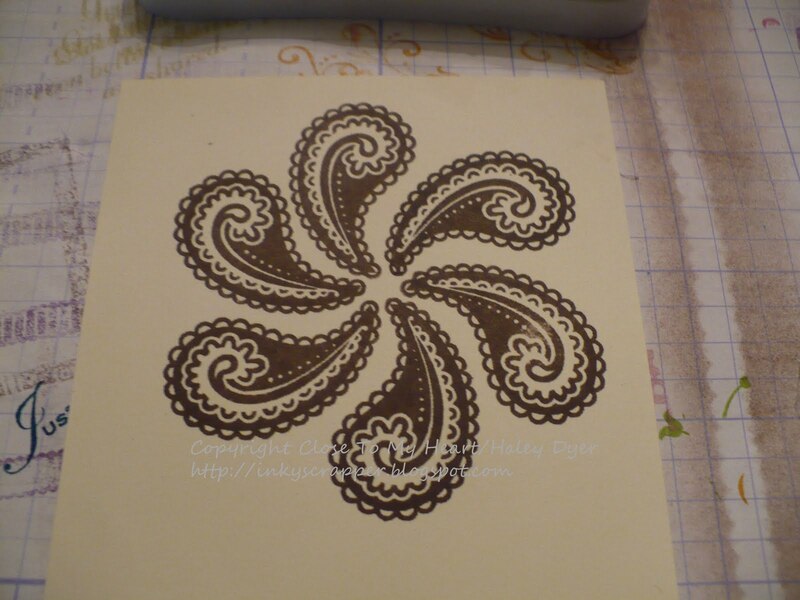 You will also learn different stamping/paper crafting techniques. You can choose to keep your treasured pages in either the 6"x6" My Creations Display album (such a lovely end table display! 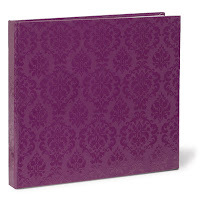 ), or the Olive or Pansy Purple Quick Pic 6"x6" album (for a more traditional scrapbook). themed layout for each month of the year. Your papers will be precut, but please bring your scissors, your favorite adhesive, and glue dots. (If you don't have these already, I can help!) 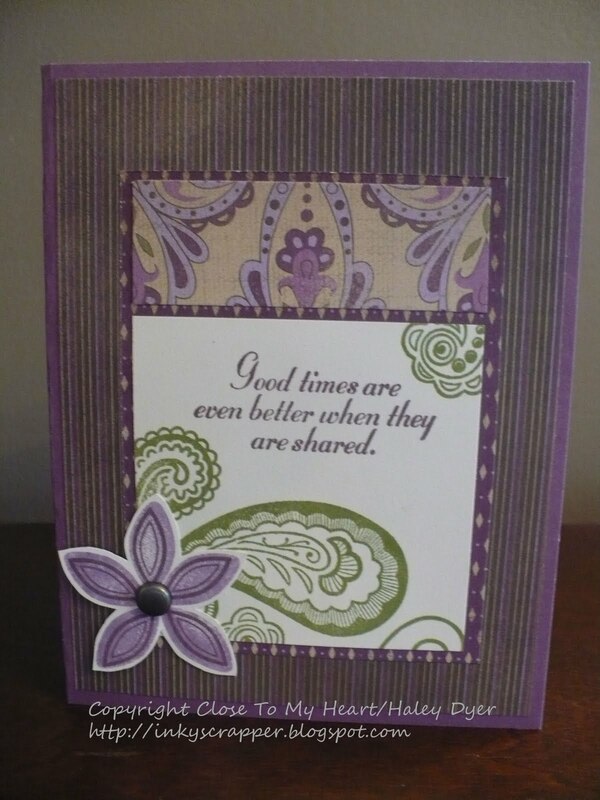 We will be embellishing our pages with a variety of fun products, plus stamping as we go. 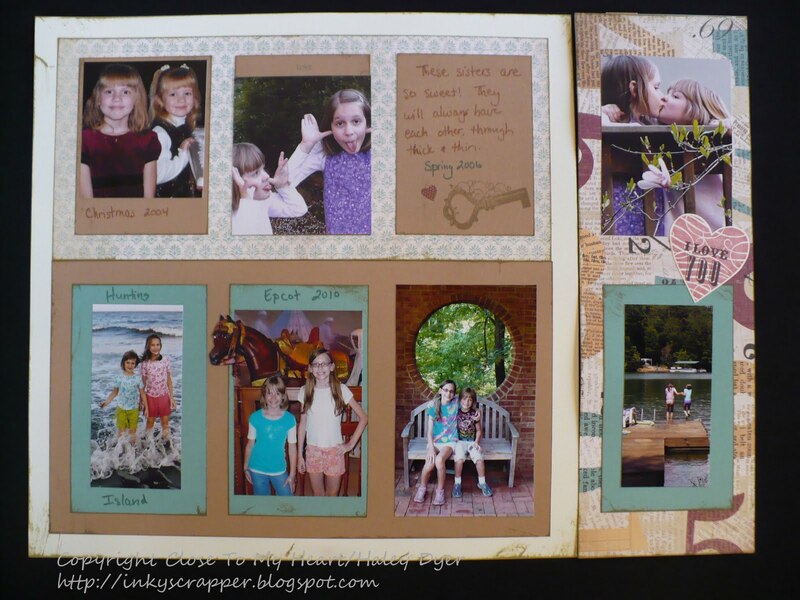 You are going to love creating this keepsake to show off your favorite photos. If you know which 12 photos you'd like to use, please bring them with you; otherwise you can add your photos later. 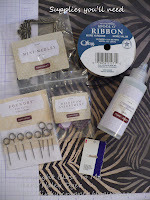 The $20 workshop fee includes everything you need except scissors and adhesive (see above). If you'd like to purchase your own November stamp of the month, add on $17.95 plus S&H/tax. 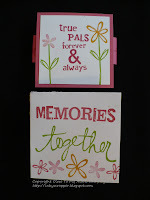 (Workshop participants will be using my stamp set, inks, and blocks.) 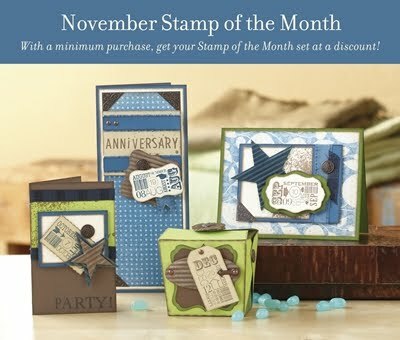 You might also want to take advantage of the November “Holiday Magic” stamp set special with your order. The workshop will be held on Saturday, December 3, at 1:00. If this date/time is not convenient, let me know and we hopefully can work something out. Please pre-order your kit and reserve your spot no later than November 21. Remember, when signing up, choose either the 6x6 display album, the Olive album, or the Pansy Purple album. Class size is limited to allow participants the time and space to create their album, so sign up today! 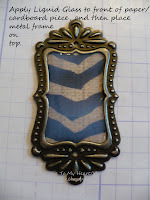 Heart 2 Heart Challenges is issuing another great challenge this week: use metal on your project. 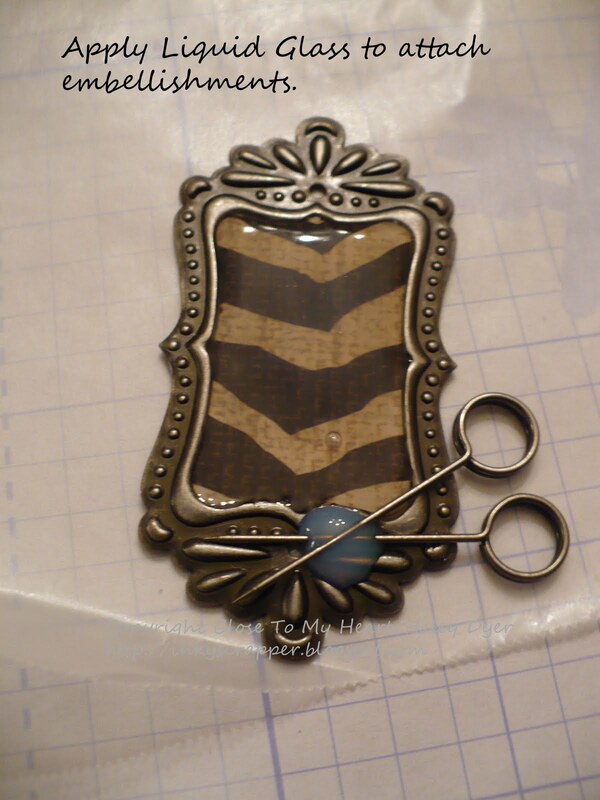 I have been wanting to make myself some new jewelry, so this challenge was the motivation I needed to get going. 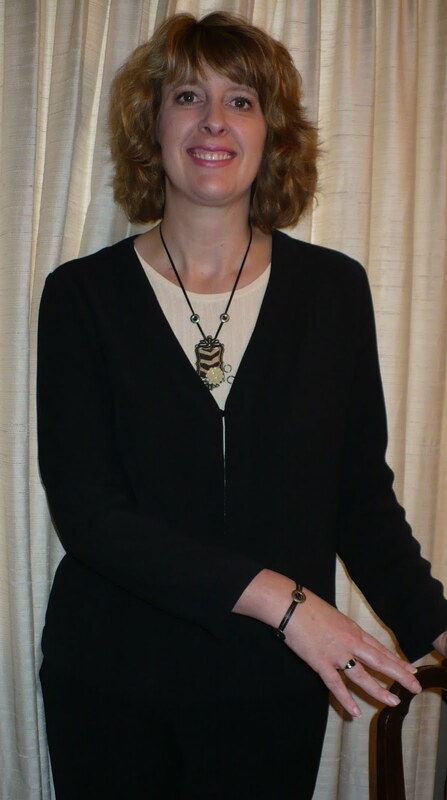 At right, you'll see the necklace and bracelet set that I made. 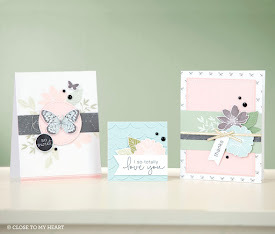 If you'd like to read through my tutorial, continue on; otherwise, head to H2H challenges to see how our fabulous design team members interpreted the challenge and to link up your project. 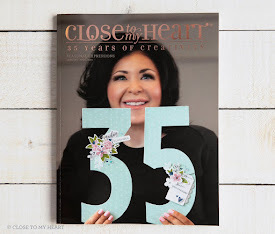 Remember, you must use some Close To My Heart products for this challenge blog. 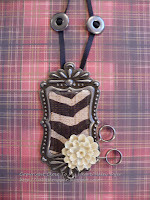 I'm also linking this project up to You Had Me at Craft: Make It Yourself Mondays. cut your base from an empty cereal box. (Mine is slightly larger than 1"x1.5".) 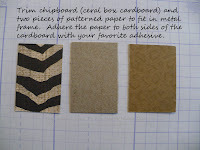 Cut two pieces of patterned paper to cover each side of the cardboard and adhere with your favorite adhesive. After lining your work space with waxed paper, apply Liquid Glass (slowly and carefully) to the front of your cardboard piece. Be sure the LG goes all the way to the edges. Then, place the frame on top of this piece. Push the edges down to adhere firmly, and then move this piece so that it doesn't stick to the waxed paper (in case some of the LG oozed out). 3. While this is drying, measure 1 yard of ribbon. Run it through the two slides. To keep them from sliding, loop the ribbon back through each one again. Set aside. some where you don't want it, try to scrape it off quickly. 5. Once everything is completely dry, turn the pendant over. (I added a brad to fill in the top hole of the frame; the bottom hole was covered by my charms.) This brad also helped to secure my ribbon. 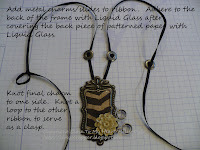 Apply LG to the back, especially including the ribbon to attach the pendant to the necklace. 6. Once the back is completely dry, attach the final slide to serve as the fastener. Make a loop in the other end. 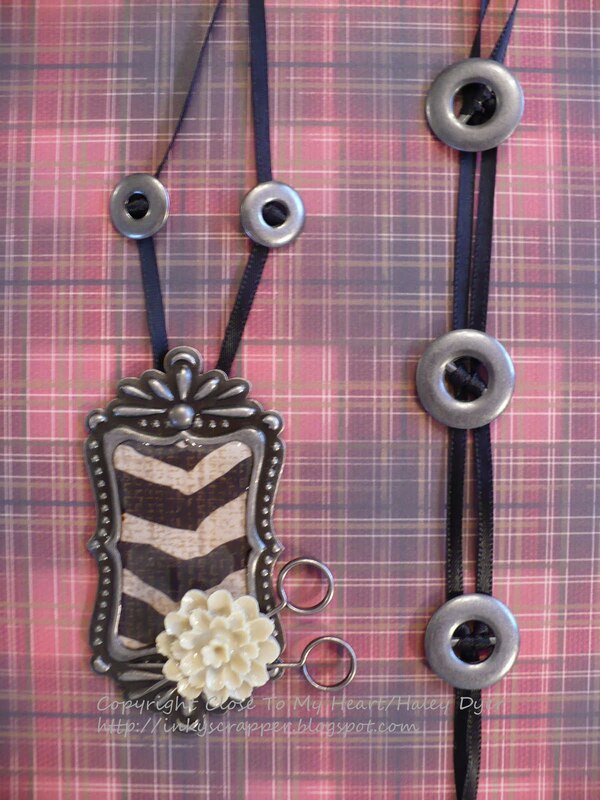 Trim ribbon. 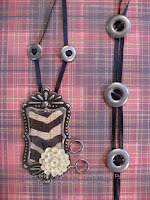 Apply LG to the knots so that the ribbon doesn't slip. Let dry. 7. 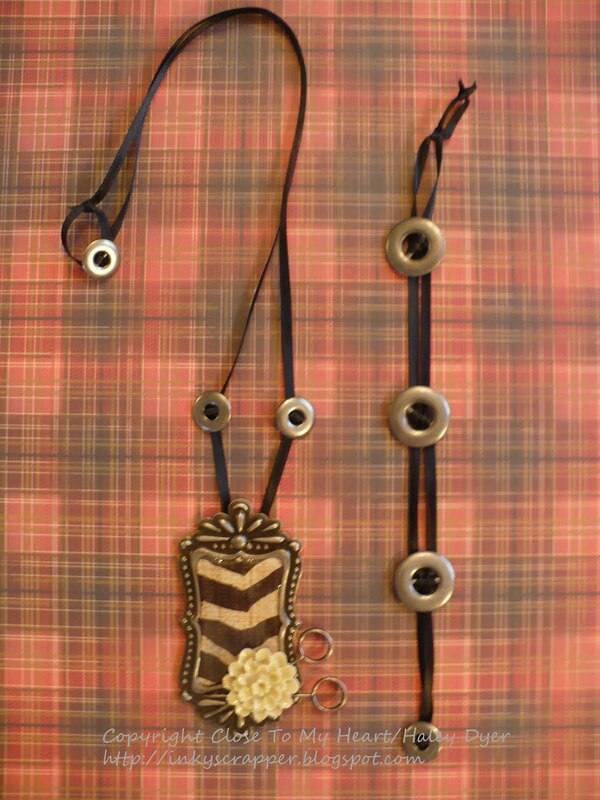 Once dry, your necklace is ready to wear! 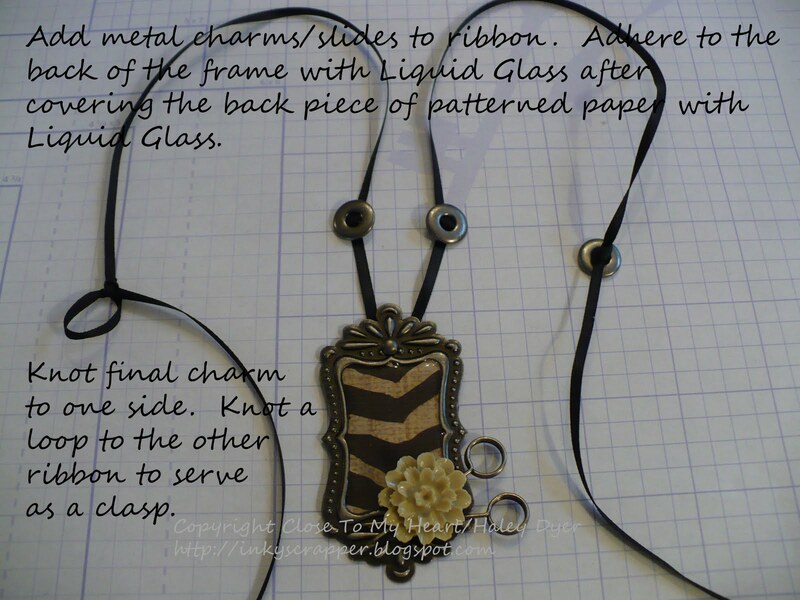 If you'd like to make a matching bracelet, cut two pieces of the same ribbon at least 1' long. String them through the slides and knot in place. 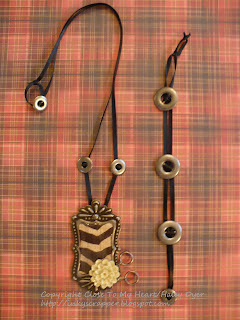 Use the final washer as a fastener and make a loop of ribbon at the other end. 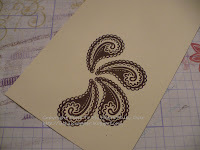 Again, trim and use LG to keep the ribbon from slipping or fraying. Thanks for sticking with me! Let me know if you have any questions. I'd love for you to give this a try! 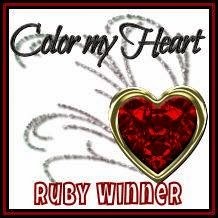 If you leave a link to your finished jewelry, I'd love to stop by and look at it. Happy crafting! 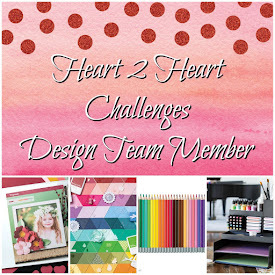 Don't forget to visit the Heart 2 Heart Challenges blog if you haven't already. 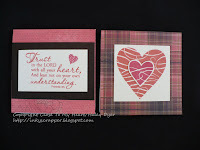 Close To My Heart is offering two special stamp sets for November only! 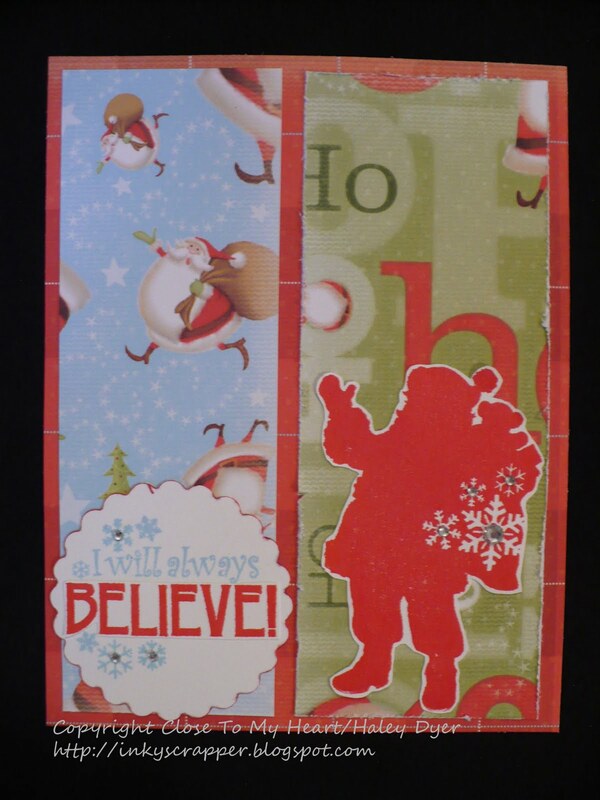 You can read all about the Holiday Wishes special stamp set offer HERE (PDF file for you). We also have a great stamp of the month, Cherish the Day, for November. 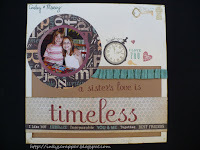 Remember, scroll down if you're looking for the November stamp of the month blog hop!